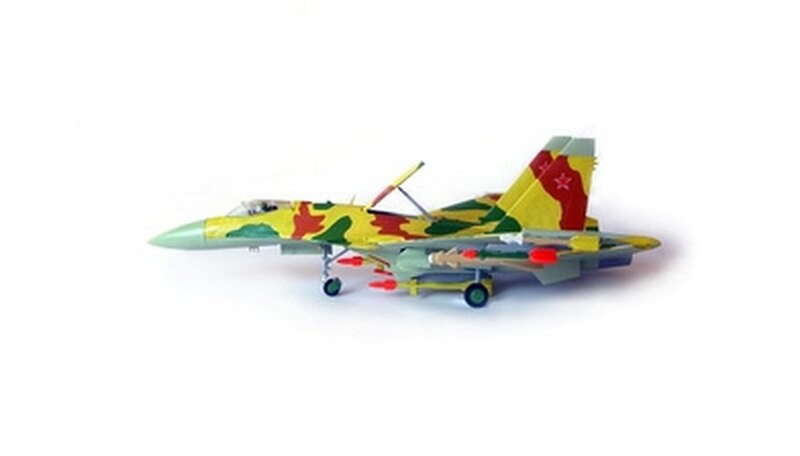 Building wooden model airplanes is a challenging and engrossing hobby. It requires attention to detail and a steady hand, but the results can be amazing. Whether you choose a kit-built plane or build one from scratch, many of the basic steps are the same. Decide what kind of airplane you want to build. There are three basic kinds of wooden model airplanes--built from scratch, kit-built and ARF, almost ready to fly. ARF planes require very little time investment. Kit built planes usually include printed balsa wood and everything needed to complete your plane. Building from scratch is the most challenging and is not recommended for beginners. Set up your work space. Choose an area that is well-lighted and within easy reach of an electrical outlet. You will need a card table on which to work and a building board which you can create yourself from an old bulletin board or a cork ceiling tile. Assemble your tools. There are some basic tools that you must have before you can begin to build model wooden airplanes. These include straight pins, sandpaper, a good craft knife or set of craft knives, a ruler and glue. Read the instructions from start to finish before beginning. It is important to understand what you will be doing and the order in which you will be doing each step. If you are building from scratch or if your kit does not have pre-printed or punch-out balsa wood pieces, you will have to transfer the plans to the balsa wood. One of the easiest ways to do this is to pin the plan on top of the balsa wood sheet, then carefully draw over every line in the plan with a blunt number two pencil or an orange stick. Exert just enough pressure to impress the cutting lines into the balsa sheet. Label the pieces to avoid confusion. Using a hobby knife, carefully cut the airplane pieces from the balsa wood sheet. It is best to cut out just the pieces you will need to build the wooden airplane one section at a time. Keep your plans nearby so that you can easily identify pieces if you get confused. Sand each piece carefully until it is perfectly smooth. Use a sanding block if required to avoid rounding the edges. Pin the wooden pieces in place on your work board to hold them in place. Apply glue to the joints. Allow it to dry before removing pins. Build one section at a time. Assemble the sections of the plane. The order of assembly will depend on the plan or kit that you have chosen. Use a craft knife to remove any excess dried glue that will weigh the plane down. Cover the wooden frame with tissue paper skin. Depending on your instructions, you may cover the skeleton one piece at a time as it is completed, or cover the completed plane skeleton. In either case, draw a line of airplane glue along each wooden rib, then carefully smooth tissue paper over the skeleton. Spritz lightly with a water mister and allow to dry. When the glue is dry, paint over the entire plane with thinned airplane glue. Paint your finished plane if desired.